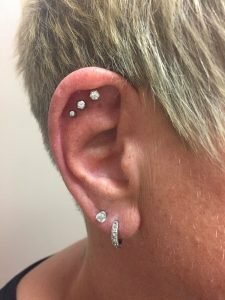 With piercings becoming more common as a fashion consideration, it’s a perfectly reasonable measure to think about coordinating and incorporating your piercings into your overall fashion style. Below are some suggestions on areas of the body that can fit multiple piercings and even ways to personalize those piercings. We get a lot of people in, asking if they can try jewelry on to see what it would look like before they get pierced. We’re not able to do this but some of our locations have stick on pieces that can give you the idea of what a piercing might look like. We also have magnetic pieces that can do the same. If you don’t live near a location that has these, you can always stop at a craft store and grab a pack of small gem stickers. This can give you the same effect. There are many areas of the body that people choose to pierce in multiple spots, typically close together. The forward helix is a common place, where people usually put 2-3 in a row. 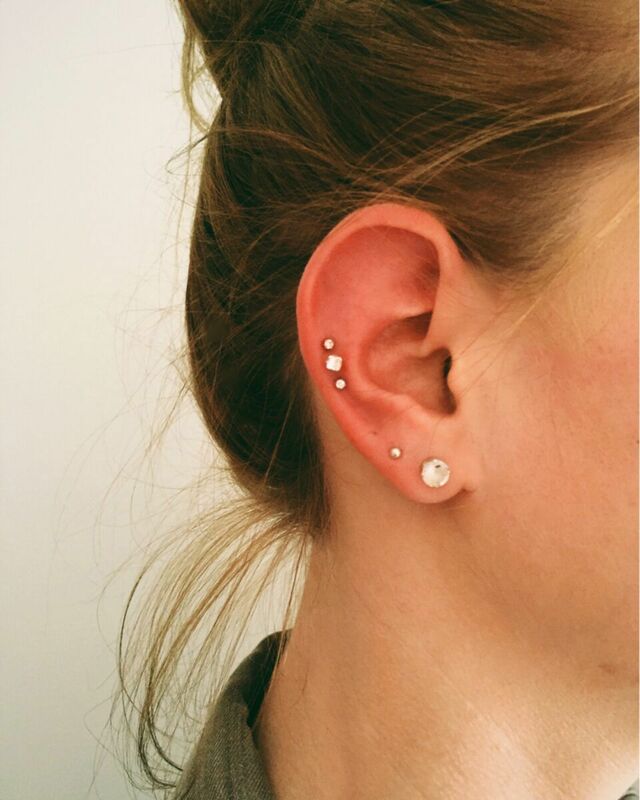 The face of the cartilage or helix is also a popular spot. Dermals can be put in clusters, lines, shapes, sometimes people will get really creative and put them into the shape of a constellation (check out another one of our blogs for inspiration) Most of our piercers say that’s what they love most about their job – being able to take our clients’ creative ideas and make them a reality. Just as you can get as creative as you would like with your piercings, you can get just as creative with your jewelry. We have an array of colored gems, opals, and solid colored beads to customize your piercing to suit you and your style best. You can also consider piercings that are pieces of a larger whole, ones that may be separate pieces but work in concert to produce an aesthetically pleasing whole. Some combos to consider might be ones that incorporate both tragus and anti-tragus piercings that give a sense of duality or possibly even paradox. Sure, you can have a half dozen holes punched in your ears and try out all sorts of crazy combinations. But perhaps you don’t need to do that. You might just need one truly distinctive piercing that works as a statement piece. 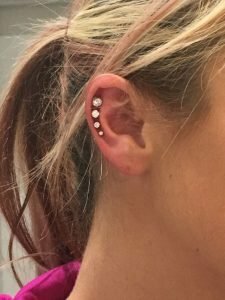 A daith piercing with the right piece of jewelry can accomplish this easily and will certainly be distinctive. Ultimately, what you do with your piercings comes down to a matter of personal style and taste. Our staff here at Almost Famous Body Piercing can help you with that. Give us a call or come on down and we’ll work with you to find something that suits you best.